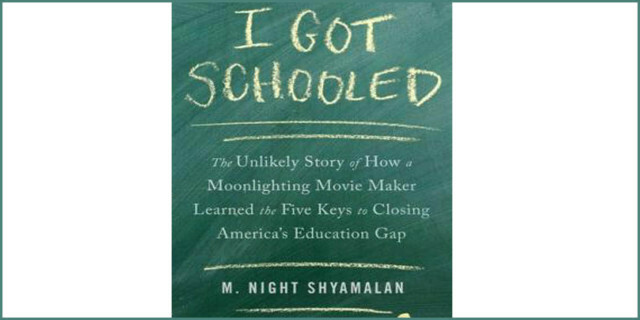 M. Night Shyamalan is best known as a brilliant film maker, so I was intrigued by his most recent, entirely different type of production – a diligently researched book on what makes schools really work, and what does not, entitled I Got Schooled; The Unlikely Story of How a Moonlighting Movie Maker learned the Five Keys to Closing America’s Education Gap. This is gripping reading for school-improvement nerds such as myself and, most important, he actually delivers. He tells us what really, truly works, based on a thorough and professional review of all the research his team could find. The end result may be the Holy Grail of school improvement. Shyamalan starts by looking into some very reasonable possible means by which schools can be improved, including smaller classes, higher levels of training for teachers and more funding in general. All of these sounded good to me, so I was pleased to find we were on the same page – and dismayed to find out that the research just didn’t support my imagined solutions. Rest assured, he wasn’t too pleased either. But along the way he gained an interesting insight, from a medical friend. When asked what made people healthy, his buddy explained it was a combination of things: healthy eating, exercise three times a week, don’t smoke, sleep eight hours nightly, and find a relatively stress-free job. All of these factors, in combination, dramatically reduce the likelihood of becoming seriously ill. But leave any one of those out, and the magic doesn’t hold up. Just cutting out smoking, while continuing to eat junk food, won’t be enough. It’s all or nothing. Pondering this, Shyamalan wondered: would a similar mix of factors apply to school improvement and, if so, what would those factors be? 1. No Roadblock Teachers. As much as I want to support teachers and unions, once I get past my defensiveness I can’t argue with this one at all – we’ve all had lousy teachers at some point. We do our best to roll with the experience. If we have other resources, such as educated, involved parents, internet access and self-motivation, we can get past crummy teaching. But if we don’t, we can’t. As it turns out, bad teachers measurably drag down student performance – these teachers are damaging, and we need to make it easy to show them the door. 2. The Right Balance of Leadership. Good principals make a huge difference. The great ones will measurably improve school performance wherever they go. The bad ones will measurably undermine it. The ideal principal is a great teacher, and she spends most of her time – 80% — visiting classrooms, providing constructive criticism and modeling good teaching. 3. Feedback. The most effective schools do measure their success a lot. So do a lot of less successful schools. The difference is that the great schools know how to interpret the results of their testing and translate them into tangible guides that help teachers learn to teach more effectively. The point of the testing is to generate useful feedback, not to rank, belittle or punish anyone. 4. Smaller Schools. I was intrigued by this point—it’s not smaller classrooms that make a difference, it’s smaller schools overall. Apparently we max out on connecting to other people at about 150 total. This is supported by the observation that schools that stop enrollment at 600 seem to do better than larger schools. That translates, by the way, to 150 students per grade. Not only does this make sense on a social level, but on a pragmatic one—the thinner our attention is spread, the less time we can invest in fine-tuning feedback for each and every student. 5. More Time In School. The most effective schools offer not only longer school days, but longer school years. Long breaks of weeks or months in length – the worst being summer vacations – undermine learning in a big way. Wealthier families with plenty of resources can at least maintain their children’s knowledge base through these breaks with extra tutoring, special classes, access to the internet and plenty of books. Poorer families are less likely to provide those percs, and as a result their kids lose ground, year after year, until they’re miles behind. These certainly aren’t the only things we can do to improve school outcomes, and they focus strictly on academics, but Shyamalan makes a more than convincing case that these five key factors should be primary in any holistic attempts at improving American schooling.